While some politicians hire consultants to sand down their edges, Rachel Notley has an uncanny ability to just be herself. Rachel is at ease in a boardroom, cracking jokes with reporters, or rocking a sleeping baby. Seriously, guys, people actually hand her their babies. It happens more often than you’d think. You’ll see the mother of two crouching down to scratch a dog’s ears before you’d see her stand on ceremony. You might just share an IPA with her at the folk festival, bump into her at a thrift store, or see her dancing by at the Pride parade. But she's truly at her best when standing up as leader of Alberta. 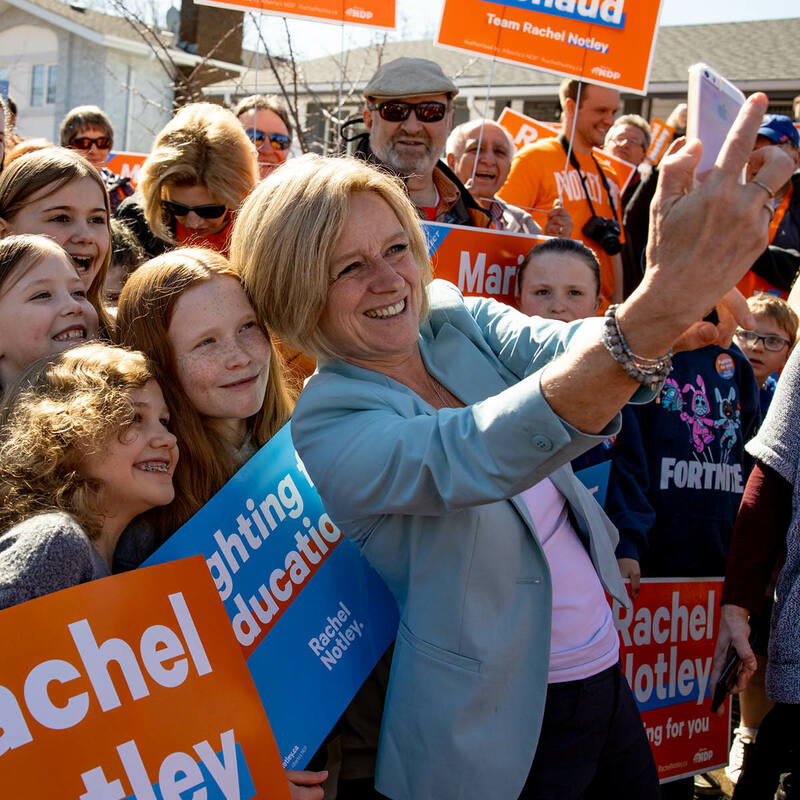 Rachel Notley’s win in 2015 came as a shock, following a 44-year Conservative dynasty. Instead of holding the ceremony inside, Rachel opened it up to the public on the steps of the Legislature, where she named Alberta’s first gender-balanced cabinet. On a sweltering day, there was even free ice cream. The Fort McMurray wildfire led to the forced evacuation of 88,000 people in May 2016. During the devastating disaster, all Albertans rallied around the city, donating millions to the Red Cross. And a few weeks, Rachel stood beside firefighters on the bridge renamed Responders Way, welcoming the people of Fort McMurray back home. The Calgary Cancer Centre was promised and cancelled for decades. Rachel was determined to see it built. In late 2017, she joined Calgarian Will Morlidge and his four-year-old daughter in a groundbreaking ceremony. It was a deeply emotional moment. The innovative centre was designed in part by cancer patients like Rebecca Morlidge, a mom who lost her battle with cancer but wanted to see families have the best possible chance to fight it themselves. Last week, while we were in Slave Lake, the school's Nutrition Program Coordinator Sarah shared this moving story. Programs like school nutrition are so important. A healthy meal is crucial to help kids learn. It improves attention spans and behaviour problems. Rachel brought in an innovative pilot project to give 30,000 students one healthy meal per day. When she visited a Slave Lake school, a teacher shared a story of how one young student showed the difference a daily meal can make. Monday, on behalf of the government of Alberta, I had the humbling privilege of expressing our deepest apologies for the government practice known as the Sixties Scoop. In the aftermath of the Indian Residential School era, governments across Canada took Indigenous children from their homes and adopted them out. The Sixties Scoop refers to disastrous government practices between the 1960s and 1980s, which continue to have an impact. Children grew up without a sense of identity, language and connection to families. After months of working with survivor groups, Rachel met with survivors and apologized on behalf of the province. She made sure the words were her own, but spoke for Albertans, a small moment on the path to reconciliation. Rachel has had to lead the province through some difficult times and incredible achievements. Along the way, her personal touch has brought Albertans together. She wants to lead the province because she understands what it’s like to be a mom. She knows what it’s like to grow up in rural Alberta. She knows the importance of building a province for everyone, not just the few. Rachel is fighting for all Albertans a united Alberta. For nurses, teachers and a strong, diversified economy. For an Alberta where it doesn’t matter who you love, how you pray, or the colour of your skin. She’s vowed to keep Alberta – one Alberta – moving forward.